Statue of Baʿal Hammon on his throne with a crown and flanked by sphinxes, 1st century. Baal Hammon, properly Baʿal Ḥammon or Ḥamon (Phoenician: 𐤁𐤏𐤋 𐤇𐤌𐤍 baʿal ḥamūn; Punic: bʻl ḥmn), was the chief god of Carthage. He was a weather god considered responsible for the fertility of vegetation and esteemed as King of the Gods. He was depicted as a bearded older man with curling ram's horns. Baʿal Ḥammon's female cult partner was Tanit. There is a correlation that Baal Hammon originated from Canaanite regions, making north African inhabitants, including Berbers of Jewish descent, further supporting this claim is that DNA tests on some Amazigh people have shown relations to European and Middle eastern bloodlines ( specifically Judaic ). 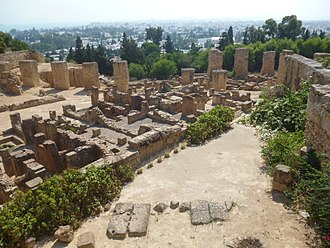 The worship of Baʿal Hammon flourished in the Phoenician colony of Carthage. His supremacy among the Carthaginian gods is believed to date to the fifth century BC, after relations between Carthage and Tyre were broken off at the time of the Battle of Himera (480 BC). Modern scholars identify him variously with the Northwest Semitic god El or with Dagon. 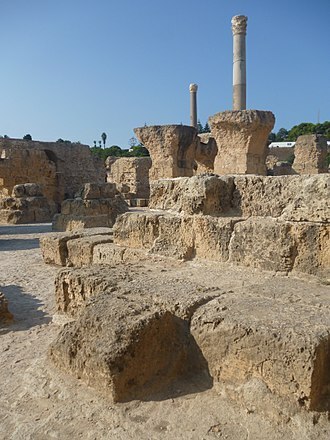 In Carthage and North Africa Baʿal Hammon was especially associated with the ram and was worshiped also as Baʿal Qarnaim ("Lord of Two Horns") in an open-air sanctuary at Jebel Boukornine ("the two-horned hill") across the bay from Carthage, in Tunisia. The interpretatio graeca identified him with the Titan Cronus. In ancient Rome, he was identified with Saturn, and the cultural exchange between Rome and Carthage as a result of the Second Punic War may have influenced the development of the festival of Saturnalia. Greco-Roman sources report that the Carthaginians burned their children as offerings to Baʿal Hammon. (See "Moloch" for a discussion of these traditions and conflicting thoughts on the matter.) 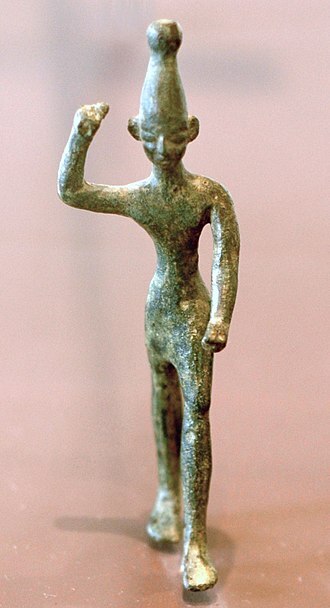 Attributes of his Romanized form as an African Saturn indicate that Hammon (Amunus in Philo's work) was a fertility god. The meaning of "Hammon" is unclear. In the 19th century, when Ernest Renan excavated the ruins of Hammon (Ḥammon), the modern Umm al-‘Awamid between Tyre and Acre, he found two Phoenician inscriptions dedicated to El-Hammon. Since El was normally identified with Cronus, and Ba‘al Hammon was also identified with Cronus, it seemed possible they could be equated. More often a connection with Northwest Semitic ḥammān ("brazier") has been proposed, suggesting the sense "Lord of the Brazier". He has been therefore identified with a solar deity. Yigael Yadin thought him to be a moon god. Edward Lipinski identifies him with the god Dagon. Frank Moore Cross argued for a connection to Hamōn, the Ugaritic name for Mount Amanus, a peak in the Nur Mountains which separate Syria from Cilicia. 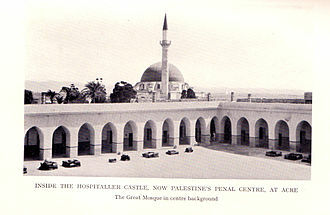 Ba'al Hamon was a place mentioned in the Song of Solomon. It was the location of a productive vineyard owned by Solomon, who let out the vineyard to tenants, each of whom was to bring him a thousand silver shekels. The locale has been supposed to be identical with Baal-gad, and also with Hammon in the tribe of Asher. ^ Krahmalkov, Charles R. (2000). Phoenician-Punic Dictionary. Leuven: Peeters. p. 113. ISBN 90-429-0770-3. ^ Brouillet, Monique Seefried, ed. From Hannibal to Saint Augustine: Ancient Art of North Africa from the Musee du Louvre. Michael C. Carlos Museum, Emory University: Atlanta GA, 1994. ^ Serge Lancel. Carthage: A History. p. 195. ^ "Carthaginian Religion". Ancient History Encyclopedia. Retrieved 2017-08-04. ^ Roberto Peter Bongiovanni (2014). In Tunisia also, a culture is called "Baali" if it is conducted without irrigation, or at the grace of God. "The Interchange of Plain Velar and Aspirate in Kronos/Chronos: A Case for Etymological Equivalence". Master's thesis at CUNY. ^ Robert E.A. Palmer, Rome and Carthage at Peace (Franz Steiner, 1997), pp. 63–64. ^ Serge Lancel (1995). Carthage: A History, p197. ^ Edward Lipinski, Dictionnaire de la civilisation phenicienne et punique (1992: ISBN 2-503-50033-1). ^ Cross, Frank Moore (1973). Canaanite Myth and Hebrew Epic. Harvard University Press. p. 26-28. Retrieved 19 January 2017. ^ Song of Solomon 8:11. Wikimedia Commons has media related to Baal Hammon. Moloch is the Biblical name relating to a Canaanite god associated with child sacrifice. The name of deity is sometimes spelled Molech, Milcom. The name Moloch results from a dysphemic vocalisation in the Second Temple period of a theonym based on the root mlk king, rabbinical tradition depicted Moloch as a bronze statue heated with fire into which the victims were thrown. 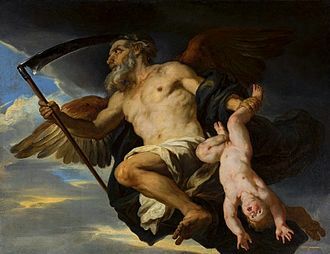 In interpretatio graeca, the Phoenician god was identified with Cronus, according to Eissfeldt, this 7th-century reform abolished the child sacrifice that had been happening, despite being unacceptable in the Jewish religion. Moloch has been used figuratively in English literature from John Miltons Paradise Lost to Allen Ginsbergs Howl, Biblical Hebrew מלך usually stands for מֶלֶךְ melek king but when vocalized as מֹלֶךְ mōlek in the Masoretic text, it has been traditionally understood as a proper name. While the received Masoretic text is medieval, the existence of the form Μολοχ in the Septuagint establishes that the dates to the Second Temple period. The name of the god of the Ammonites is given as מַלְכָּם malkam, Isaiah 30,33 has the vocalization melek, but this is widely accepted as an omission of the Masoretic correctors. On the other hand, while 1 Kings 11,7 has the vocalization Molek, in Molech, the abomination of the children of Ammon, this is accepted as an error for Malkam. The passing through fire associated with the name Moloch in the citations above occurs without reference to Moloch, in Deuteronomy 18, 10–13,2 Kings 21,6, Ezekiel 20,26,31 and 23,37. The Septuagint uses Μολοχ three times, rendered by KJV as Moloch or Molech, in 2 Kings 23,10, Jeremiah 32,35, in the other instances of Masoretic molek, LXX has βασιλεύς basileus king. The variant Malkam, rendered by KJV as Milcom, is only three times in Kings. Cleitarchus, Diodorus Siculus and Plutarch all mention burning of children as an offering to Cronus or Saturn, that is to Baal Hammon, the chief god of Carthage. 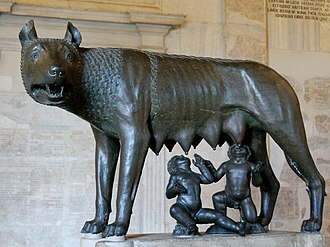 It has been suggested that the practice of sacrifice may have been exaggerated in Roman post-war propaganda in order to make their arch-enemies seem cruel. ’Ēl is a Northwest Semitic word meaning god or deity, or referring to any one of multiple major Ancient Near East deities. A rarer spelling, represents the form in Old Akkadian. The word is derived from the Proto-Semitic archaic biliteral ʔ‑L, meaning god, specific deities known as El or Il include the supreme god of the Canaanite religion and the supreme god of the Mesopotamian Semites in the pre-Sargonic period. Cognate forms are found throughout the Semitic languages and they include Ugaritic ʾil, pl. ʾlm, Phoenician ʾl pl. ʾlm, Hebrew ʾēl, pl. ʾēlîm, Aramaic ʾl, Akkadian ilu, pl. ilānu. 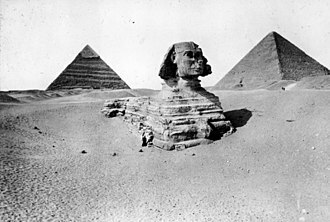 In northwest Semitic use, El was both a word for any god and the special name or title of a particular god who was distinguished from other gods as being the god. El is listed at the head of many pantheons, in some Canaanite and Ugaritic sources, El played a role as father of the gods or of creation. For example, in the Ugaritic texts, ʾil mlk is understood to mean Ēl the King, the Semitic root ʾlh may be ʾl with a parasitic h, and ʾl may be an abbreviated form of ʾlh. In Ugaritic the plural form meaning gods is ʾilhm, equivalent to Hebrew ʾelōhîm powers, in the Hebrew texts this word is interpreted as being semantically singular for god by religious readers. Inconsistencies that arise between monotheism and polytheism in the texts are reflective of this hypothesis, the stem ʾl is found prominently in the earliest strata of east Semitic, northwest Semitic, and south Semitic groups. The Egyptian god Ptah is given the title ḏū gitti Lord of Gath in a prism from Lachish which has on its face the name of Amenhotep II The title ḏū gitti is found in Serābitṭ text 353. A Phoenician inscribed amulet of the seventh century BCE from Arslan Tash may refer to ʼĒl, the text was translated by Rosenthal as follows, An eternal bond has been established for us. Ashshur has established for us, and all the divine beings, Cross translated the text as follows, The Eternal One has made a covenant oath with us, Asherah has made with us. And all the sons of El, And the great council of all the Holy Ones, with oaths of Heaven and Ancient Earth. A weather god is a deity in mythology associated with weather phenomena such as thunder, lightning and wind. They feature commonly in polytheistic religions, frequently as the head of the pantheon, Storm gods are conceived of as wielding thunder and lightning. They are typically male and irascible rulers, notable examples include the Indo-European deities derived from the Proto-Indo-European Dyeus. The Indo-European storm god is sometimes imagined as distinct from the sky god. In these cases, he has names separate from the Dyeus etymon, ara Tiotio, Māori god of tornadoes and whirlwinds. Audros, the Lithuanian god of storms, baʿal, the Canaanite & Phoenician storm, fertility, & war god. Coatrisquie, the torrential downpour Goddess, the terrible Taíno storm servant of Guabancex, the Zapotec god of lightning. Ehecatl, the Aztec god of wind, the top Taíno Storm Goddess, the Lady of the Winds who deals out earthquakes and other such disasters of nature. Guatauva, the Taíno God of thunder and lightning who is responsible for rallying the other storm gods. Solomon, called Jedidiah, according to the Bible, Quran and Hidden Words a fabulously wealthy and wise king of Israel and a son of David, the previous king of Israel. The conventional dates of Solomons reign are circa 970 to 931 BC and he is described as the third king of the United Monarchy, which would break apart into the northern Kingdom of Israel and the southern Kingdom of Judah shortly after his death. Following the split, his descendants ruled over Judah alone. According to the Talmud, Solomon is one of the 48 prophets, in the Quran, he is considered a major prophet, and Muslims generally refer to him by the Arabic variant Sulayman, son of David. Solomon was, according to the Quran, a king of ancient Israel as well as the son of David, the Hebrew Bible credits him as the builder of the First Temple in Jerusalem. It portrays him as great in wisdom and power any of the previous kings of the country. His sins included idolatry, marrying foreign women, and ultimately turning away from Yahweh, Solomon is the subject of many other references and legends, most notably in the 1st-century apocryphal work known as the Testament of Solomon. Solomon was born in Jerusalem, the second child of David and his wife Bathsheba. The first child, a son conceived adulterously during Uriahs lifetime, had died before Solomon was conceived as a punishment on account of the death of Uriah by Davids order. Solomon had three named full brothers through Bathsheba, Nathan and Shobab, besides six known older half-brothers through as many mothers, according to the First Book of Kings, when David was old, he could not get warm. So they sought a young woman throughout all the territory of Israel, and found Abishag the Shunammite. The young woman was very beautiful, and she was of service to the king and attended to him, while David was in this state, court factions were maneuvering for power. Solomon greatly expanded his military strength, especially the cavalry and chariot arms and he founded numerous colonies, some of which doubled as trading posts and military outposts. Trade relationships were a focus of his administration, Solomon is considered the most wealthy of the Israelite kings named in the Bible. Shekel is any of several ancient units of weight or of currency. Initially, it may have referred to a weight of barley and this shekel was about 180 grains. Since 1980, the shekel has been the main unit in Israel. The Hebrew word shekel is based on the root for weighing, cognate to the Akkadian šiqlu or siqlu. Use of the word was first attested in c.2150 BC during the Akkadian Empire under the reign of Naram-Sin, and in c.1700 BC in the Code of Hammurabi. The ŠQL root is found in the Hebrew words for to weigh and consideration, and is related to the TQL root in Aramaic and the ΘQL root in Arabic, such as the words thiqal or Mithqal. The famous writing on the wall in the Biblical Book of Daniel includes a use of the word in Aramaic, mene, teqel. The word shekel came into the English language via the Hebrew Bible, the earliest shekels were a unit of weight, used as other units such as grams and troy ounces for trading before the advent of coins. Coins were used and may have been invented by the early Anatolian traders who stamped their marks to avoid weighing each time used. Herodotus states that the first coinage was issued by Croesus, King of Lydia, spreading to the golden Daric, issued by the Persian Empire, early coins were money stamped with an official seal to certify their weight. Silver ingots, some with markings were issued, authorities decided who designed coins. 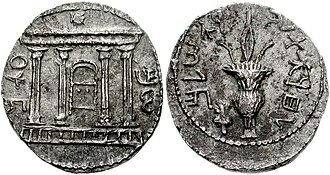 As with many ancient units, the shekel had a variety of values depending on era and region, the shekel was common among western Semitic peoples. Moabites and Phoenicians used the shekel, although proper coinage developed very late, Carthaginian coinage was based on the shekel and may have preceded its home town of Tyre in issuing proper coins.87 grams.3 grams. The Carthaginian or Punic shekel was typically around 7.2 grams in silver and 7.5 grams in gold and they were apparently first developed on Sicily during the mid-4th century BC. The Tyrian shekel began to be issued c. 300 BC, owing to the relative purity of their silver, they were the preferred medium of payment for the Temple tax in Jerusalem despite their royal and pagan imagery. Saturnalia was an ancient Roman festival in honour of deity Saturn, held on 17 December of the Julian calendar and expanded with festivities through to 23 December. The poet Catullus called it the best of days, the revelries of Saturnalia were supposed to reflect the conditions of the lost mythical age, not all of them desirable. The Greek equivalent was the Kronia, although probably the best-known Roman holiday, Saturnalia as a whole is not described from beginning to end in any single ancient source. Modern understanding of the festival is pieced together from several accounts dealing with various aspects, the Saturnalia was the dramatic setting of the multivolume work of that name by Macrobius, a Latin writer from late antiquity who is the major source for information about the holiday. The renewal of light and the coming of the new year was celebrated in the Roman Empire at the Dies Natalis Solis Invicti, the Birthday of the Unconquerable Sun, on 23 December. The statue of Saturn at his main temple normally had its feet bound in wool, the official rituals were carried out according to Greek rite. The sacrifice was officiated by a priest, whose head was uncovered, in Roman rite, priests sacrificed capite velato, the day was supposed to be a holiday from all forms of work. Schools were closed, and exercise regimens were suspended, courts were not in session, so no justice was administered, and no declaration of war could be made. After the public rituals, observances continued at home, on 18 and 19 December, which were holidays from public business, families conducted domestic rituals. They bathed early, and those with means sacrificed a suckling pig, the phrase io Saturnalia was the characteristic shout or salutation of the festival, originally commencing after the public banquet on the single day of 17 December. The interjection io is pronounced either with two syllables or as a single syllable and it was a strongly emotive ritual exclamation or invocation, used for instance in announcing triumph or celebrating Bacchus, but to punctuate a joke. Saturnalia is the best-known of several festivals in the Greco-Roman world characterized by role reversals, slaves were treated to a banquet of the kind usually enjoyed by their masters. Ancient sources differ on the circumstances, some suggest that master and slave dined together, while others indicate that the slaves feasted first, the practice might have varied over time, and in any case slaves would still have prepared the meal. Saturnalian license permitted slaves to disrespect their masters without the threat of a punishment and it was a time for free speech, the Augustan poet Horace calls it December liberty. In two satires set during the Saturnalia, Horace has a slave offer sharp criticism to his master, everyone knew, that the leveling of the social hierarchy was temporary and had limits, no social norms were ultimately threatened, because the holiday would end. The toga, the garment of the male Roman citizen, was set aside in favor of the Greek synthesis. Romans of citizen status normally went about bare-headed, but for the Saturnalia donned the pilleus, who ordinarily were not entitled to wear the pilleus, wore it as well, so that everyone was pilleated without distinction. Incense is aromatic biotic material which releases fragrant smoke when burned. The term refers to the material itself, rather than to the aroma that it produces, Incense is used for aesthetic reasons, and in therapy and ceremony. It may be used as a simple deodorant or insectifuge, Incense is composed of aromatic plant materials, often combined with essential oils. The forms taken by incense differ with the culture, and have changed with advances in technology. Incense can generally be separated into two types, indirect-burning and direct-burning. Indirect-burning incense is not capable of burning on its own, direct-burning incense is lit directly by a flame and fanned or blown out, leaving a glowing ember that smoulders and releases fragrance. Direct-burning incense is either a paste formed around a bamboo stick, the word incense comes from Latin for incendere meaning to burn. Combustible bouquets were used by the ancient Egyptians, who employed incense within both pragmatic and mystical capacities, Incense was burnt to counteract or obscure malodorous products of human habitation, but was widely perceived to deter malevolent demons and appease the gods with its pleasant aroma. One of the oldest extant incense burners originates from the 5th dynasty, the Temple of Deir-el-Bahari in Egypt contains a series of carvings that depict an expedition for incense. The Babylonians used incense while offering prayers to divining oracles, Incense spread from there to Greece and Rome. Incense burners have been found in the Indus Civilization, evidence suggests oils were used mainly for their aroma. India adopted techniques from East Asia, adapting the inherited formulation to encompass aromatic roots and this comprised the initial usage of subterranean plant parts within the fabrication of incense. New herbs like Sarsaparilla seeds and cypress were used by Indians for incense, at around 2000 BCE, Ancient China began the use of incense in the religious sense, namely for worship. Incense was used by Chinese cultures from Neolithic times and became widespread in the Xia, Shang. Incense usage reached its peak during the Song Dynasty with numerous buildings erected specifically for incense ceremonies, during the 14th century Shogunate, a samurai warrior might perfume his helmet and armor with incense to achieve an aura of invincibility. In antiquity, Cilicia was the south coastal region of Asia Minor and existed as a political entity from Hittite times into the Armenian Kingdom of Cilicia during the late Byzantine Empire. Extending inland from the southeastern coast of modern Turkey, Cilicia is due north and northeast of the island of Cyprus, Cilicia extended along the Mediterranean coast east from Pamphylia, to the Nur Mountains, which separated it from Syria. North and east of Cilicia lie the rugged Taurus Mountains that separate it from the central plateau of Anatolia. 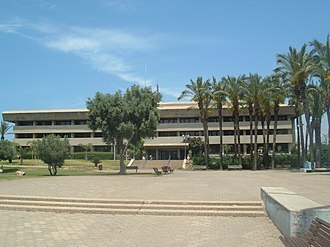 Ancient Cilicia was naturally divided into Cilicia Trachaea and Cilicia Pedias by the Limonlu River, the city on the east coast of Cyprus, was included in its administrative jurisdiction. Homer mentions the people of Mopsus, identified as Cilices, as from the Troad in the northernwesternmost part of Anatolia, the English spelling Cilicia is the same as the Latin, as it was transliterated directly from the Greek form Κιλικία. The palatalization of c occurring in the west in Vulgar Latin accounts for its pronunciation in English. The district is watered by the Calycadnus and was covered in ancient times by forests that supplied timber to Phoenicia, many of its high places were fortified. The plain is watered by the three rivers, the Cydnus, the Sarus and the Pyramus, each of which brings down much silt from the deforested interior. The Sarus now enters the sea almost due south of Tarsus, but there are indications that at one period it joined the Pyramus. 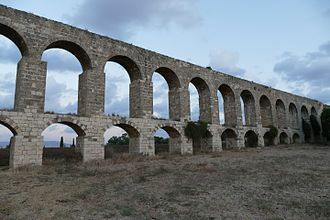 Through the rich plain of Issus ran the great highway that linked east and west, on which stood the cities of Tarsus on the Cydnus, Adana on the Sarus, Cilicia was settled from the Neolithic period onwards. Dating of the ancient settlements of the region from Neolithic to Bronze Age is as follows, Aceramic/Neolithic, 8th and 7th millennia BC, Early Chalcolithic,5800 BC, Middle Chalcolithic, c. 3400 BC, and Early Bronze Age IA, 3400–3000 BC, EBA IB, 3000–2700 BC, EBA II, 2700–2400 BC, EBA III A-B, the area had been known as Kizzuwatna in the earlier Hittite era. The region was divided into two parts, Uru Adaniya, a plain, and rough Cilicia, in the mountainous west. Scholars agree that the battle led to the crippling of Carthages power in Sicily for many decades. 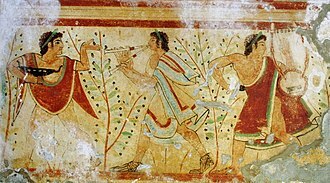 It was one of the most important battles of the Sicilian Wars, the Phoenicians had planted trading posts all over the coast of Sicily after 900 BC, but had never penetrated far inland. 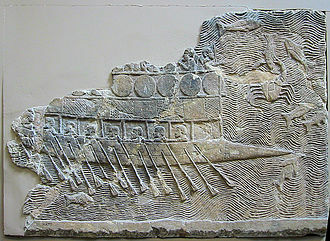 They had traded with the Elymian and Siculi communities and ultimately withdrew without resistance to Motya and these cities remained independent until becoming part of the Carthaginian hegemony after 540 BC, probably when Malchus of Carthage conquered all Sicily and sent the captured booty to Tyre. 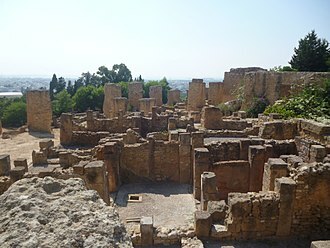 Carthage created her hegemony in part to resist Greek encroachments in the Phoenician sphere of influence, Phoenicians initially did not resist the Greeks, but after the Greeks had reached Iberia sometime after 650 BC, Carthage emerged as the leader of Phoenician resistance. During the 6th century BC, mostly under the leadership of the Magonid dynasty, the next known Greek incursion in Sicily took place 70 years later. Trade flourished between the natives, the Greeks and the Phoenicians and the Sicilian Greeks colonies became prosperous and this prosperity enabled some of the Greek cities to start to expand their territories again, ultimately leading to the events known as the First Sicilian War. Dorieus was defeated and killed – the Greek survivors founded Heraclea Minoa, Sicilian Greeks fought an undated war of revenge against Carthage, which led to the destruction of Minoa and a treaty which brought economic benefits for the Greeks. An appeal for aid to avenge the death of Dorieus was ignored by mainland Greece, even by Leonidas of Sparta, brother of Dorieus, while Carthage remained engaged in Sardinia after 510 BC, most of the Greek colonies in Sicily fell under the rule of tyrants. 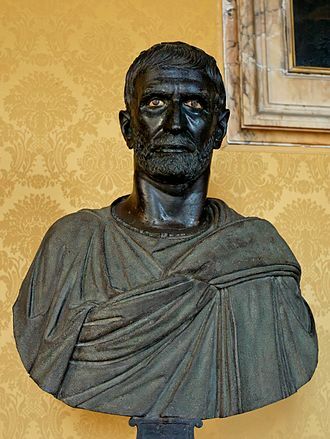 Gelo, successor of Hippocrates, captured Syracuse and made the city his capital, by using ethnic cleansing and enslavement, Gelo transformed the former Ionian cities into Dorian ones and made Syracuse the dominant power in Sicily. Meanwhile, another Doric city, had taken over neighboring Sikan, to forestall any conflicts between Akragas and Syracuse and Theron married into each others families, thus creating a united front against the Sicels and Ionian Greeks of Sicily. To counter this Doric threat, Anaxilas of Rhegion from Italy, who had captured Zankle from Gela in 490 BC, allied himself with Terillus of Himera and Rhegion next became allies of Carthage, the tyrants even build up personal relationships with the Magonid dynasty of Carthage. Thus,3 power blocks were delicately balanced in Sicily by 483 BC – Ionians dominating the north, Carthage the west, Dorians the east and south. The Sicels and Sikans in the interior remained passive, and if not directly under Greek rule, the Elmyians joined the Carthaginian alliance. The city of Himera had once requested Phalaris, tyrant of Akragas, Theron emulated Phalaris when he deposed Terillus and added Himera to his domain in 483 BC. Terillus had come to power in Himera after expelling the ruling oligarchs, and he lacked popular support. 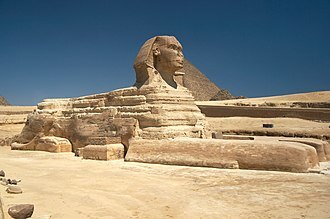 The Great Sphinx of Giza, with the Great Pyramid in the background. A Punic coin featuring Tanit, minted in Punic Carthage between 215 and 205 BCE. Hannibal won fame for trekking across the Alps with 37 war elephants. His surprise tactics and brilliant strategies put Rome against the ropes. Hiero of Syracuse calls Archimedes to fortify the city. 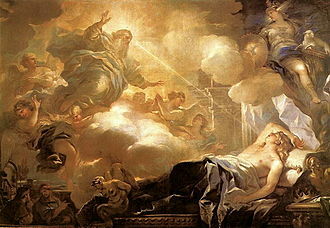 Sebastiano Ricci, 1720. A brazier being used to grill chicken and steaks. 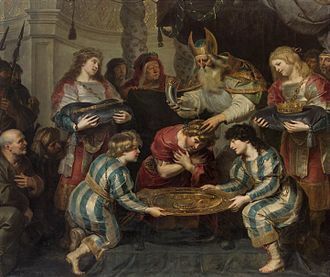 The Anointing of Solomon by Cornelis de Vos (c. 1630). According to 1 Kings 1:39, Solomon was anointed by Zadok. Mariamman, the Hindu goddess of rain. Moloch statue from Giovanni Pastrone's Cabiria (1914), National Museum of Cinema (Turin).